White background removal can mean a lot of things when it comes to editing product images. It could mean creating a transparent background, it could mean removing an unwanted background and changing it to White. Whichever method you wish to use this guide will show you the best tools to use for any type of background removal. Why do we need to remove the background of your product images? There are a number of benefits, these include greater attention and focus on your product, improved web page loading speed and simple integration across sales mediums. Removing the background from a product image can seem beyond most business owners. If you are just starting out and perhaps budgets are tight then you may need to handle your websites design tasks yourself. There are a number of different options available when it comes to removing a background from an image. Photoshop is pretty much the standard image editing software used by professionals around the world. 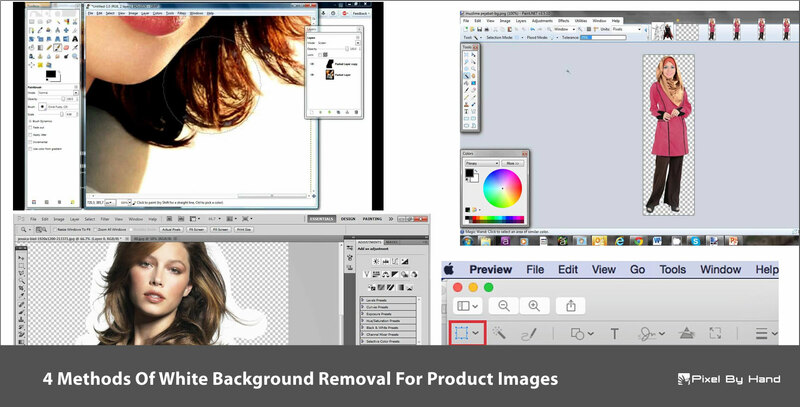 The software is packed full of features that once learned make product background removal a breeze. For a business starting out photoshop is priced fairly reasonably if you subscribe to the monthly Creative Cloud suite. You can use two tools within Photoshop to perform your background removal. The magic wand tool and the pen tool. The Magic Wand option how to select the outline of your product. It’s a perfect tool for selecting general areas, but it is weak on focusing in on the details and finer points of a shape (for example hair). The pen tool, on the other hand, is perfect for Curves, grooves and find the details. You can find a more detailed tutorial on using photoshop to remove backgrounds here. Gimp is a freely available, open source photo editing software. It is truly a Photoshop alternative if you want to go down the free route. The software is available for both Windows and OS X.
Gimp is quite a powerful editing package and it can quite comfortably remove backgrounds for the most detailed products. Paint.net is a free to purchase graphics editor program for Microsoft Windows. The software is not as powerful as the previous two options but it’s is still capable of removing product image backgrounds. In fact, the software has a fairly wide range of tools available. The software is simple to grasp, with a fairly straightforward learning curve. Obviously, the software does not have all the functionality of Photoshop, but for a free option, it will get the job done. As the title says preview is for Mac OS X only. If you were a Mac user, then you probably know all about Preview. A lot of Mac users don’t actually know that it can be used for image editing and removing backgrounds. You can use previews instant alpha tool to remove backgrounds by clicking on its icon in the toolbar. It looks like a magic wand. Is selection appears has a pink colored overlay. This selected area is the one that can be removed. These are four of the best options available for you to remove backgrounds yourself. Removing the background of your product images is a wise way to improve the look of your products instantly. Whichever package you decide to use you should work on setting standards for your images. Once you have mastered background removal you can also look at resizing, cropping, alignment and margins. If you need any further help or if you have any questions related to white background removal then you can contact us here.